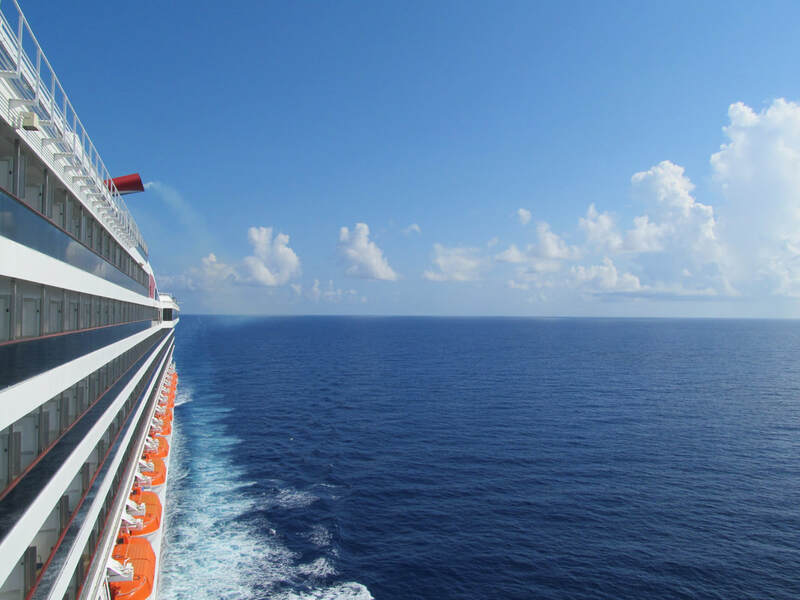 Take a self-guided cruise ship tour of the Carnival Triumph! Print this webpage and bring along with you for your cruise. Once onboard and ready to tour, finding the starting point and follow the directions. This tour covers many of the ship's main public areas and spaces. Have fun touring and bon voyage! ​ The Carnival Triumph was built in 1999, but has several of Carnival's modern amenities, features, and programs. Currently, the Carnival Triumph sails 4 & 5 night cruises from New Orleans. In spring 2019, the Carnival Triumph will be refitted and renamed to the Carnival Sunrise. This tour will be archived following the re-name, but the ship's layout will be changing when the ship is sent to dry-dock. A Carnival Sunrise self-guided ship tour will be posted at a later time. The Carnival Triumph is an easy ship to navigate, especially once cruisers get to know the ship. This self guided tour is meant to be a tool to help you familiarize yourself with the ship’s layout. Many of the ship’s public areas are included in this tour. Please keep in mind, especially on the cruise’s first day, some lounges or places may be closed for various reasons including events such as wedding receptions and other private functions. If something is closed and you wanted to look in that area, consider trying again at another time. I recommend moving to the next part of the tour. The tour works best if followed in order. This tour is not affiliated with any cruise line, ship, travel agency, or travel group. If you find any errors, problems, or areas without clarity please let me know. I want to make this tour as accurate & helpful as possible so please let me know of any problems! Also, please keep in mind the ship's areas are subject to change! 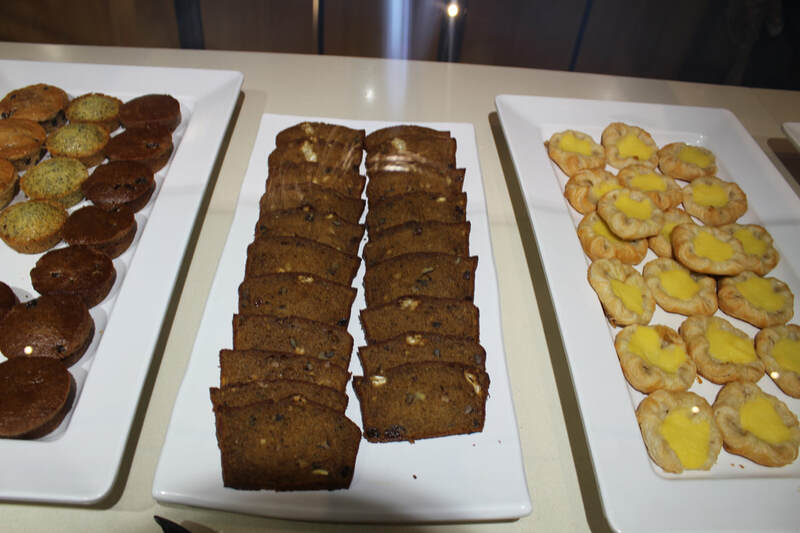 To begin this self guided tour go to the Carnival Triumph's atrium lobby, which is on the Lobby Deck (deck 3). The official name of the atrium is the Capitol Atrium. ​1. Capitol Atrium Lobby – Lobby Deck 3 This tour begins in the Carnival Triumph's Capitol Atrium Lobby by the atrium bar. Look up and you will see the many levels of the atrium as well as the glass dome located near the top. The Carnival Triumph's atrium has four glass elevators. In the center of the atrium is the atrium bar. Two important areas that you can see here are the Guest Services desk and the Shore Excursions desk. If you look towards the glass elevators, you will see the atrium lobby bar by the elevators. In that direction, on Deck 3, is the way you would walk to go to the Deck 3 level of the Rome Lounge. 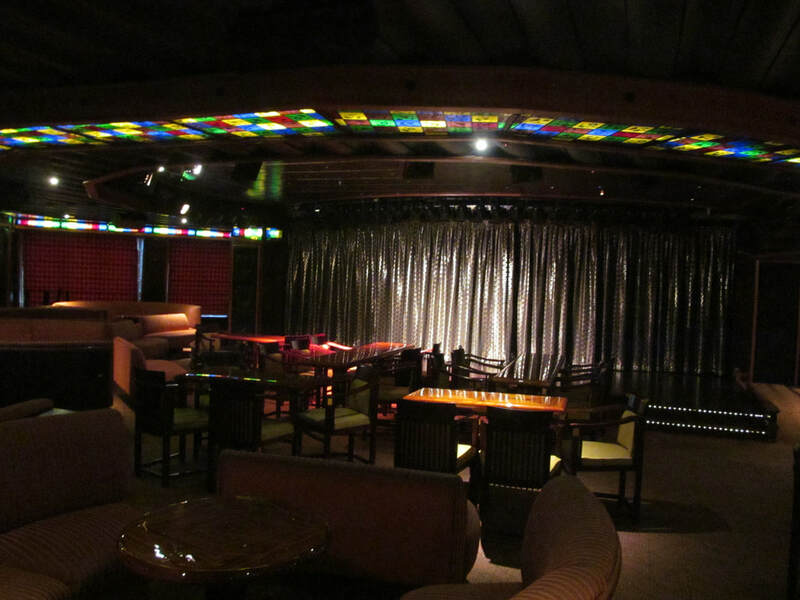 The Rome Lounge is the Carnival Triumph's main show lounge, which is where events and production shows often happen. 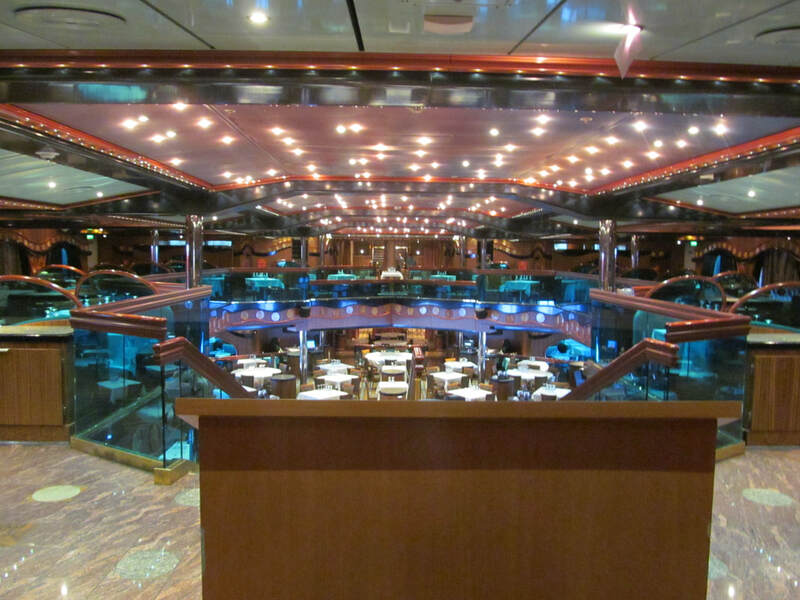 In the opposite direction, you will see the Deck 3 entrance to the Carnival Triumph's London Dining Room. The Carnival Triumph has two main dining rooms and each one is two decks. The dining room and floor a cruiser is assigned to will be printed on his or Sail & Sign cards. ​Deck 4 Overview: The Atlantic Deck, which is deck 4, is directly above the Lobby Deck (3) and below the Promenade Deck (5). This deck has no guest staterooms. At the front of this deck a cruiser will find the second level of the Rome Lounge, which is the ship's main show lounge. Around the atrium is the ship's photo gallery and the entrance to the Washington Library. In the middle of this deck is the Oxford Bar as well as the second floor of the Carnival Triumph's other dining room, known as the Paris Dining Room. Touring This Deck: Once you are on Deck 4, I recommend circling the atrium. As you circle the atrium you will be in the ship's photo gallery, known as Pixels. As you walk around the atrium you will see the entrance to the Washington Library. If you are able, take a quick look inside. Typically, the ship's library has some books, board games, and puzzles. In the atrium, near the Washington Library, you should see an area cut-out for the London Dining Room's entrance. Continue walking into the London Dining Room's Deck 4 level. When you enter the dining room you should see a host station and many tables throughout the entire dining room. Pick a side to walk in and head to the back of the dining room. As you walk out the other side of the dining room you will see the mid-ship elevator area. Keep walking and to your left you will see a hallway that curves some. Walk down that hallway! After walking in this hallway, you dead-end into the Oxford Bar. The Oxford Bar is sometimes used for events and activities. It has a complete bar area that is open at select times. For the purposes of this tour, continue walking through the Oxford Bar. After you exit the Oxford Bar you will be in a mini-atrium area known as the World Hall. In addition, you will also see the entrance to the Deck 4 level of the Paris Dining Room. 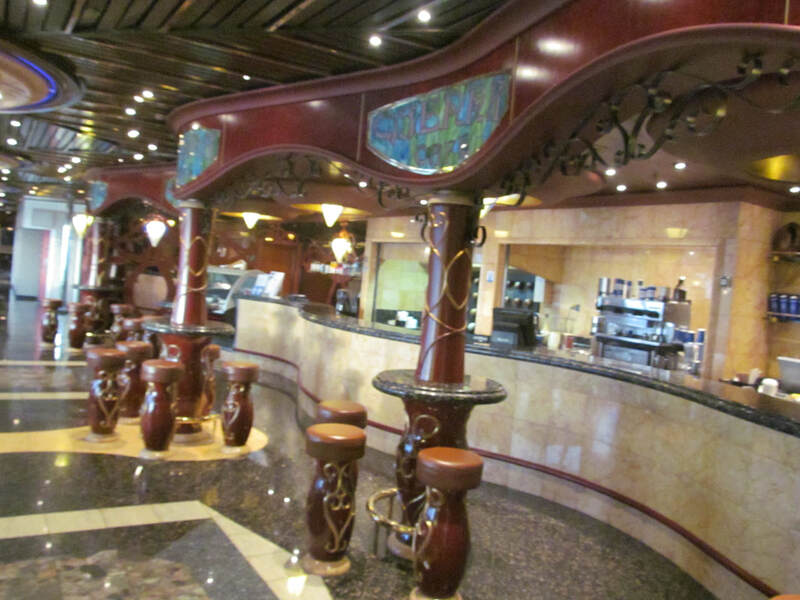 The Paris Dining Room is the Carnival Triumph's other main dining room. Touring This Deck: Once you take the elevator or stairs up one deck, you will be on Deck 5. Find World Hall mini atrium area of Deck 5, which should be right back the back elevators and stairwell. 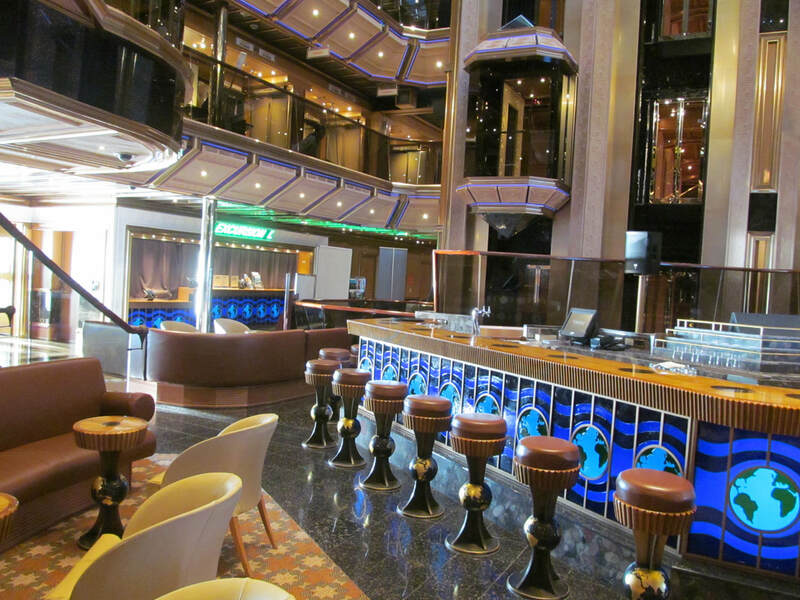 When the tour was on Deck 4, you probably saw the Paris Dining Room, but on the Deck 5 level of this area you will see the Big Easy Piano Bar, Club Rio Aft Lounge, and the Venezia. ​a) First let's go into the Club Rio AFT Lounge. This area is typically used for the comedies and karaoke. If you step inside this area you will see a stage, several areas to sit, and a bar at the back of the lounge. This lounge is located at the very back (aft) of the Promenade Deck. b) Next, walk into the Venezia, which is located right by the Club Rio AFT Lounge. This lounge is small, but is sometimes used for activities. c) After walking out of the Venezia Lounge, directly across the way you should see an entrance to the Big Easy Piano Bar. Walk towards the piano bar and go inside. Inside the Big Easy Piano Bar, you will see places to sit and a big piano in the center of the room. ​When you exit the piano bar, do not head back into the World Hall mini-atrium. Instead, start walking towards the front of the ship. If you are heading in the right direction, almost instantly you will see the side of the Hollywood Dance Club on your right and the Alchemy Bar on your left. When you see the Alchemy Bar, take a second to pause. 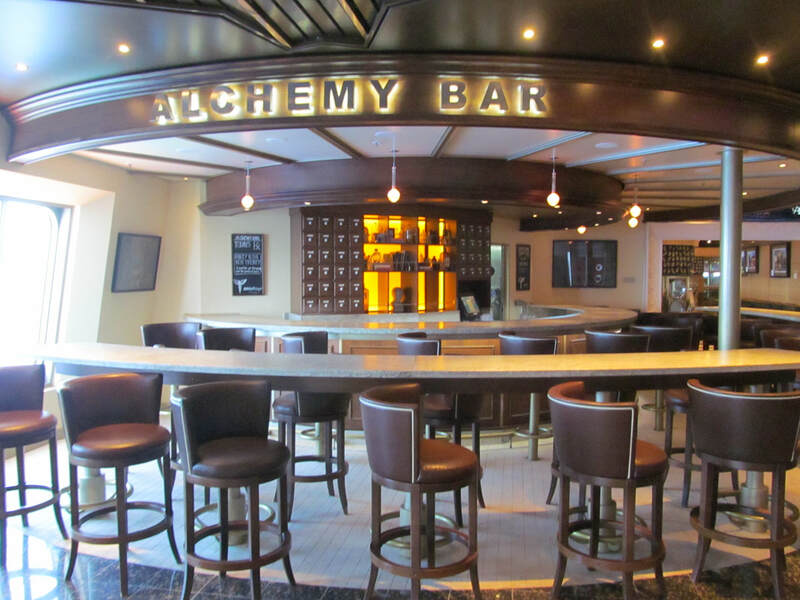 The Alchemy Bar is a Fun Ship 2.0 feature that was added to the Carnival Triumph in 2013. 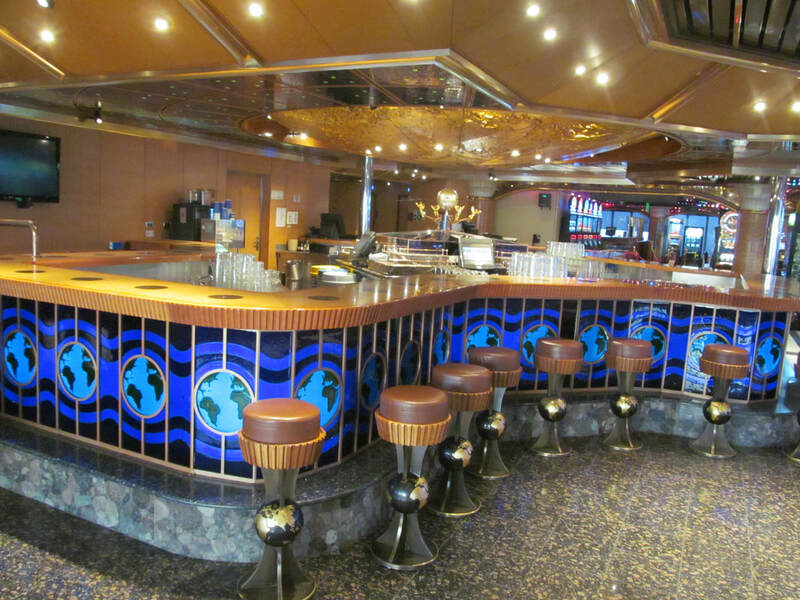 Cruisers that visit the Alchemy Bar can have a custom cocktail or beverage mixed for them. When you continue walking you will see you are in a large walkway that has seating on one side (by the windows) and entrances to lounges and places on your left. This large walkway is known as the World's Way Promenade. Hollywood Dance Club - This is the ship's disco and is mainly used in the evenings. Also sometimes this area has been referred to as Club Hollywood. Vienna Cafe - Cruisers can purchase coffee, shakes, and sweets here. Internet Cafe - You will see a few places with computers setup. To purchase an internet package you will complete the instructions on the computer to gain access. World's Bar - This is the bar located right by the casino. 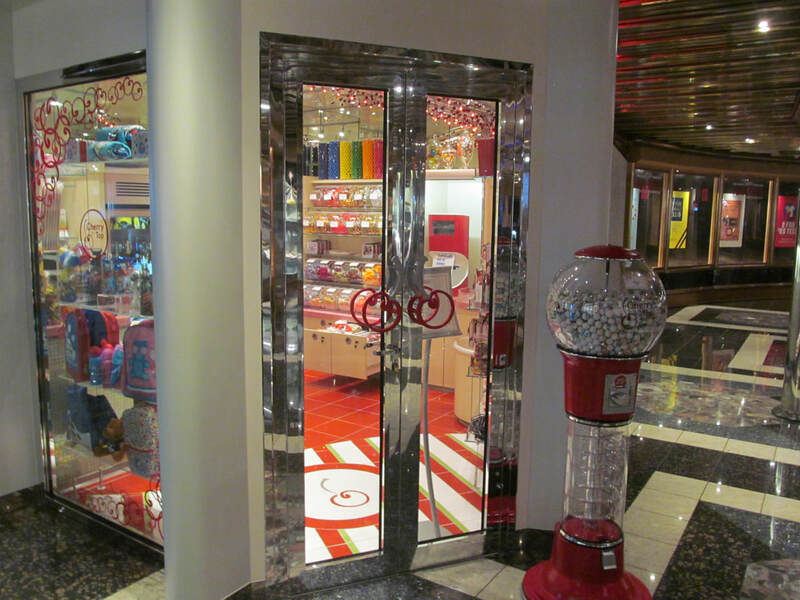 If you continued walking forward on the Carnival Triumph's Worlds Way Promenade you will come to the ship's atrium. 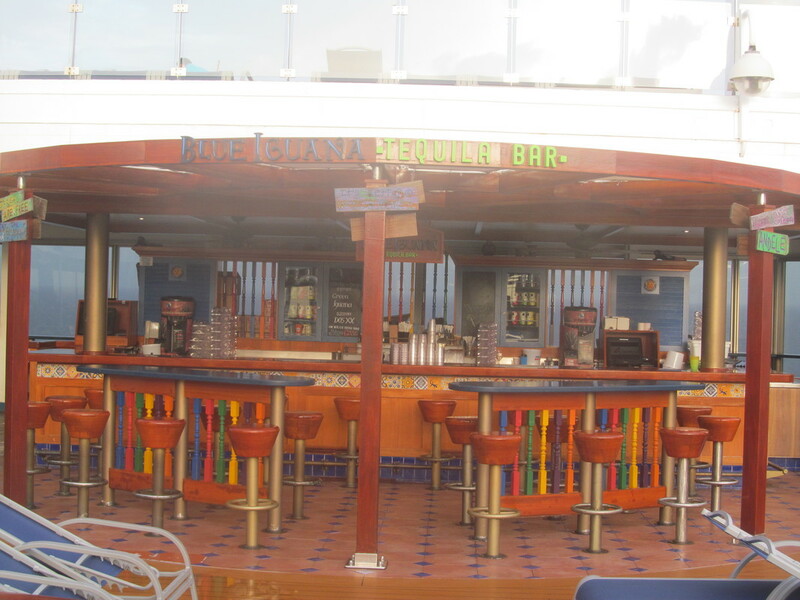 b) Skybox Sports Bar - This is the Carnival Triumph's Sports Bar. Inside the sports bar is one large bar counter, several big screens, a long marquee that displays game scores, and a few other places to sit. ​Deck 9 Overview: The Lido Deck (9) is directly above the Verandah Deck (8) and below the Panorama Deck (11). The front part of the Lido Deck consists of staterooms, but the middle and back are filled with public areas. ​As you step outside into the main pool area, the first thing you should see is the main pool. If you look up you will see the Carnival Triumph's SeaSide Theater and funnel above. The SeaSide Theater is used for showing TV shows, movies, and broadcasting poolside activities. As you continue to walk forward you will see the main pool. On the left side of the main pool (assuming you are facing the SeaSide Theater) you will see the Blue Iguana Tequila Bar and on the right you will see the Red Frog Rum Bar. Both of these bars serve a variety of different drinks. For the purposes of this tour walk on the right side of the main pool. 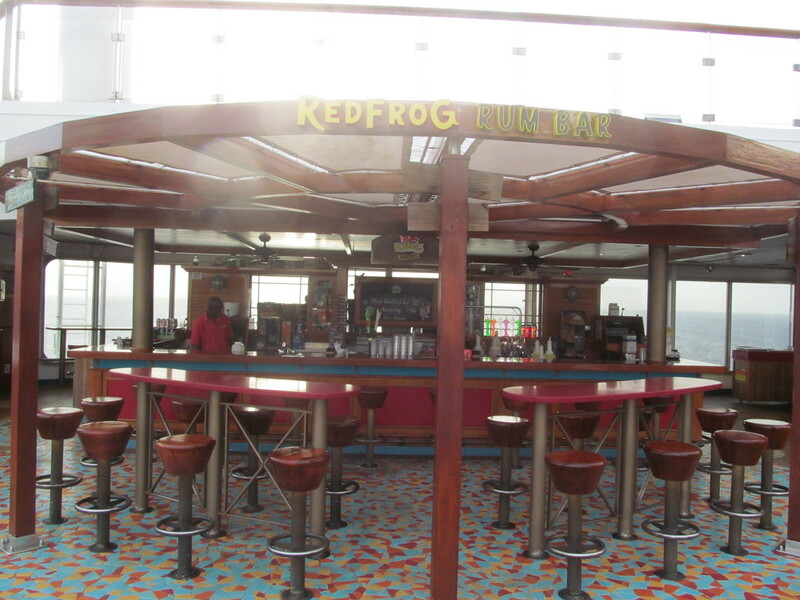 You will pass by the ship's towel station and Red Frog Rum Bar. Continue heading towards the back of the ship. 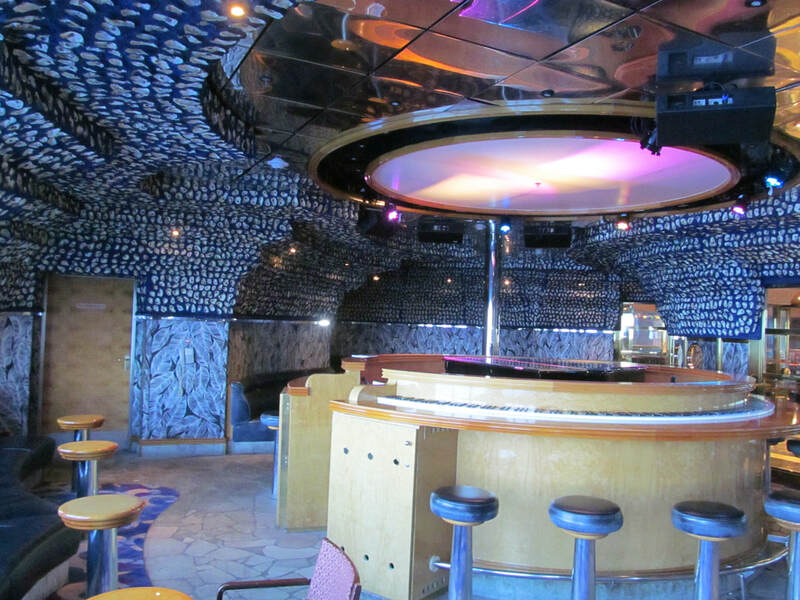 Once you are inside you will be in the Carnival Triumph's main Lido buffet, which is called the South Beach Club. Continue walking towards the back of the ship. As you walk towards the back you will pass by the ship's deli, buffet lines, and at least one drink station. Change Deck: When you are done looking around this area go to the nearest elevator or stairwell. Since you are in the atrium, you can take a glass elevator or take the nearby front elevators. You may also use the front stairwells if you wish. Go from Deck 9 to Deck 10, which is the Panorama Deck. ​Deck 10 Overview: The Panorama Deck (10) is directly above the Lido Deck (9) and below the Spa Deck (11). The front part of the Panorama Deck consists of staterooms. The middle of this deck consists of deck space. At the middle-back area of the Panorama Deck is the second level of Rosie's Lido Buffet. The second deck level of the buffet has additional seating and a drink station, but there are no food buffet lines located on this level of the South Beach Club. Touring This Deck: After you get off the elevator or stairwell, do not walk directly outside. Instead, on both sides of the stairwell look for the inside entrance into the second level of the South Beach Club. There is no food buffet line on this deck, but there is a drink station on one side. Find the nearest exit to an outside deck and step outside. If you see the ship's retractable roof you are looking at the back of the ship. Walk the other way (towards the ship's front). As you walk to the front, you should pass a stairwell that goes up to Deck 11. This would take you to the Carnival Triumph's jogging track. This tour will not be include going up to the jogging track. Furthermore, from Deck 11 you can access a Deck 12 space that is right by the ship's funnel. Continue walking towards the front of the ship. You will pass by the main Lido Deck pool and deck areas below. Look for two doors (near the ship's waterslide landing) that will take you inside. 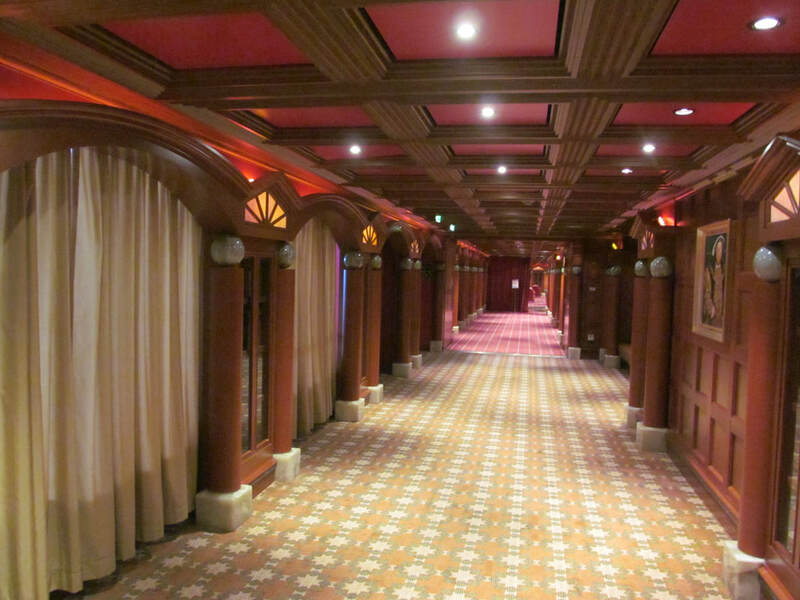 When you walk inside you will see a stateroom hallway on one side, but on the other is front elevators / stairwell area. ​Deck 11 Overview: The SPA Deck (11) is directly above the Panorama Deck (10) and below the Sun Deck (12). This deck is split into two parts. The front part of the deck consists of the SPA, gym, and some staterooms, but the middle/back part consists of the ship's jogging track (that this tour did not include). The Carnival Triumph's Camp Ocean youth facilities are also located on this deck. The Camp Ocean youth program facilities are located on this deck as well. On both sides of the entrance to the SPA you will find a narrow hallway that leads to the Camp Ocean entrances. Camp Ocean is the youth program for 2-11 old children. Change Deck: Take the stairwell up to Deck 12, which is the Sun Deck. 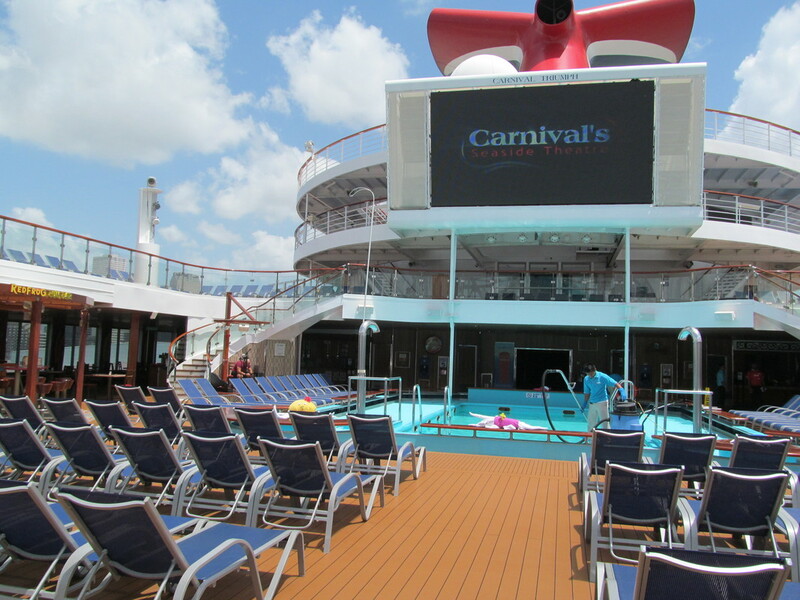 You will find yourself on the front portion of Deck 12. I think there is an accessible elevator for those that need assistance that goes from Deck 11 to Deck 12. ​Deck 12 Overview: The Sun Deck (12) is directly above the SPA Deck (11) and below the Sky Deck (14). The front area of this deck is home to Club 02 and Circle C. Also, the Carnival Triumph's mini golf course is located on this deck. 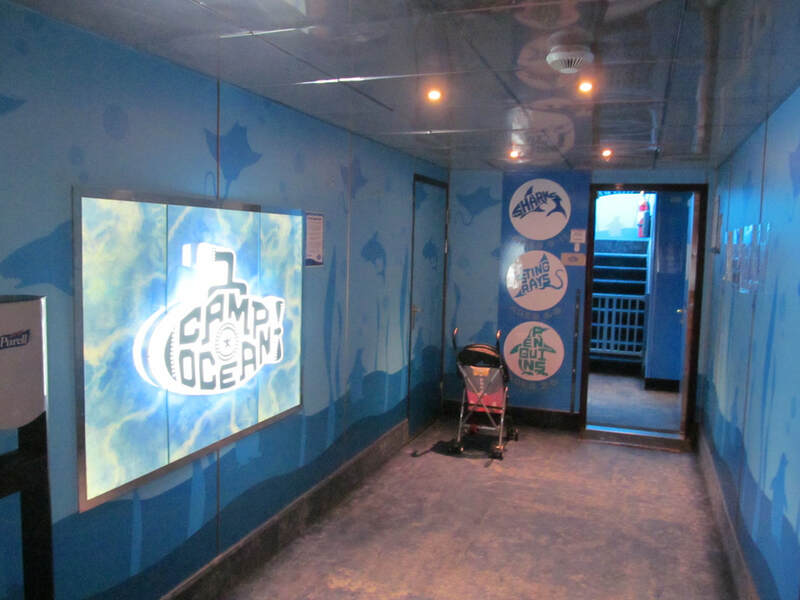 Touring This Deck: Once you are on Deck 12 you will see a very short hallway that leads to the entrances for Club 02 and Circle C. Club 02 is Carnival's youth program for 15-17 year olds and Circle C is Carnival's youth program for 12-14 year olds. The entrances to these two lounges are right next to each other. From the stairwell area you will see doors on each side that lead to the outside. 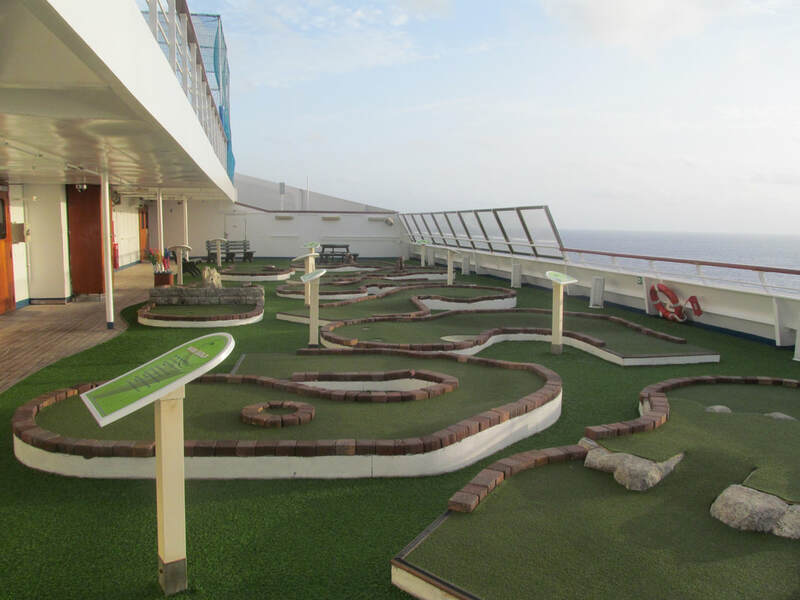 One one side you will find the Carnival Triumph's mini golf course. Typically, the mini golf clubs and balls can be found at the course and do not require check-out (unless policies have changed). Deck 14 is the highest deck of the ship. However, I am not going to include that deck on this tour. On Deck 14, you will find the entrance to the ship's waterslide. Things onboard the ship could change or vary in appearance. Please let me know of any changes that need to be made to this tour. The images used in this tour are from 2017, but are of areas that have likely not changed too much in appearance.